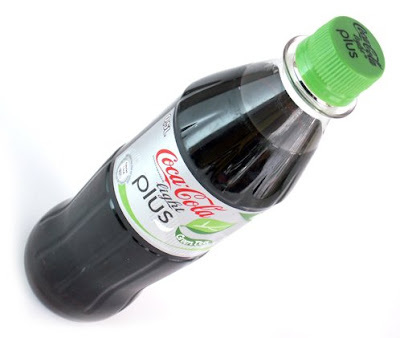 The new Coca-Cola Plus Green Tea. The design like the Plus I bought in Belgium but green and with less sunny. However the normal plus design on the can looks better than the plus design on the bottle. Not sure why but they are still using the old Coca-Cola pet bottles in Germany while in the Netherlands they have the new pet shape bottles, but not the new beverages. The label is not a plastic foil but it is two sticker labels. One is the front with the graphics and the logo and one for the back with the informations. Both glued on the pet bottle. The paper is white and printed with the colors silver, black, green and red. The backside label is only printed with the colors red, silver and black. The taste is very faint, I just can't seem to taste it. It got a high amount of carbon dioxide , bit too much for my liking. Even don't taste much when I have shaken all the carbon out of it.